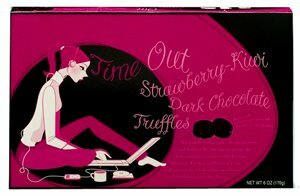 I just happened upon this Gift Box from Empress Chocolate. I confess, I'm not much interested in sampling the Strawberry-Kiwi truffles, as the choice of fruity flavoring seems more suited to the palate of a pre-teen. I'll send a box to my niece while she still thinks that all chocolate is created equal. In any event, I'm positive that she'll just love the illustration and who knows, maybe I'm the one missing out.